But the war continued for much of the next decade as an insurgency emerged to oppose the occupying forces and the post-invasion Iraqi government. Worse still, Saddam’s former military officers morphed into ISIS, which became the Islamic State. (See “Blowback: ISIS leaders are former officers of Saddam Hussein’s army”) After officially withdrawing from Iraq in 2011, the United States became re-involved in 2014 as the Iraqi government proved itself unable to cope with ISIS. The rationale for the Iraq War has since been discredited. 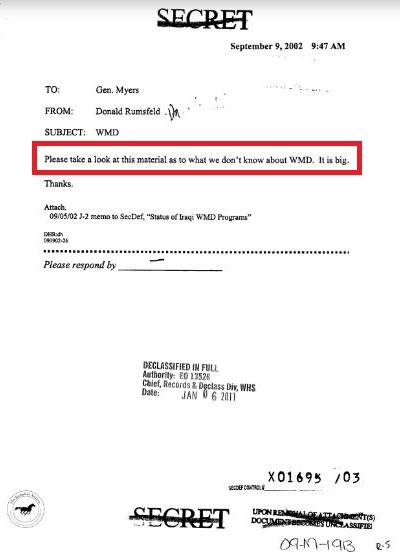 But a newly-declassified report to the then-Joint Chiefs of Staff provides even more evidence that the Bush administration went to war with, at best, flimsy evidence of Iraq’s WMDs. The Bush administration justified the invasion of Iraq on the basis that Saddam’s Iraq posed a clear and present threat to the security of the United States because they had Weapons of Mass Destruction. But it turns out that both the U.S. Defense Secretary and the Joint Chiefs of Staff knew U.S. intelligence did not support that claim in that there was no hard evidence of Iraqi WMDs. Meanwhile, Senate Republicans are fast-tracking a resolution to give Obama unlimited war-making powers — unrestricted in time or geography. Obama administration’s DHS has a list of ‘hands off’ terrorists allowed to enter U.S. This entry was posted in Iraq, ISIS, Islam, Islamic State/ISIL, United States and tagged Donald Rumsfeld, Gen. Richard Myers, Iraq intelligence report to JCS, John Walcott, Major Gen. Glen Shaffer, U.S. invasion of Iraq, US Iraq War casualties, US Iraq War costs. Bookmark the permalink.